27 lb. Redfish fish mount measures out at 42"x 22". Comes with steel hanger for easy wall display. 48 lb. Redfish fish mount measures out at 44" x 28". Comes with steel hanger on back for easy wall display. 7 lb. Bonefish replica measures out at 26" x 14" displayed on custom oval wood panel with tropical beach accent. 40 lb. Dorado fish replica measures out at 50" x 22" and comes with steel hanger on the back for easy wall display. 14 lb. Blue Fin Trevally fish replica measures out at 32" and featured on custom coral reef wall display. 32 lb. Rooster Fish replica measured out at 42" x 24" and featured on a custom coral reef wall mount interpretive display. 25 lb. 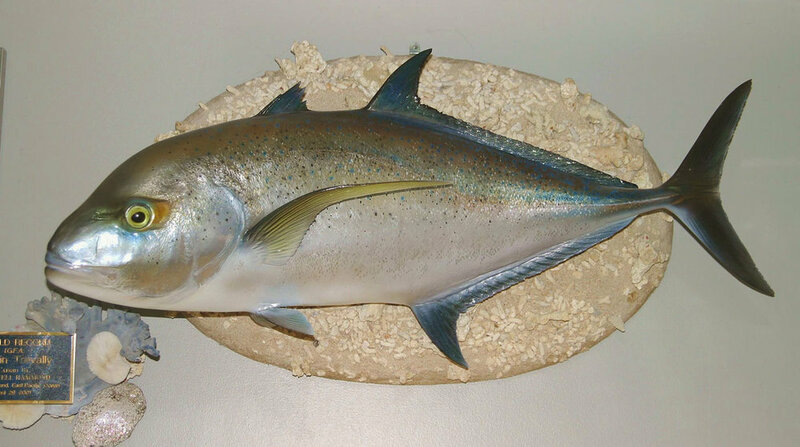 Permit fish replica measures out at 36" x 25" with steel hanger on back for easy wall display.